Personalised baby all in one sleepsuit with matching baby hat and bib gift set. 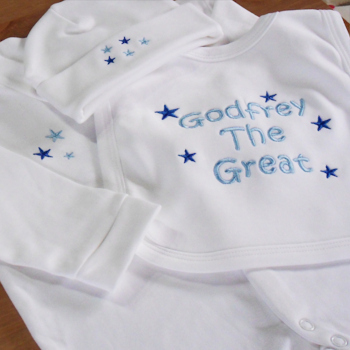 White jersey cotton long sleeved sleep suit with easy to fasten poppers down the front embroidered with little stars and your choice of wording or name on the back and some little stars on the front. The white cotton baby bib is embroidered with the same wording to match and the cotton baby hat coordinates with little stars. Select the size you require from newborn to 12 months.